Goru Chikkudu Nalla Senagala Vepudu. 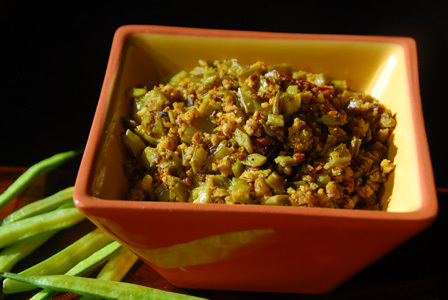 Cluster beans are finely chopped and cooked in oil along with spices. Black chickpeas are soaked and ground into smooth paste. The paste is then steamed in idli moulds and crumbled and is added to the cooked cluster beans as finishing step. Serve cluster beans with black chickpeas over plain steamed rice and dollop of ghee. Makes: around 4 Servings of Cluster Beans with Black Chickpeas. Wash, remove ends and chop cluster beans into around half inch pieces. Soak black chickpeas in water for around 6 – 8 hours. Refresh the black chickpeas with fresh water and grind them into smooth paste with enough salt. Fill the idli moulds with ground black chickpeas paste. Place the chickpeas filled idli moulds in a steamer and steam for around 15 minutes. Once steamed, remove and finely crumble the steamed black chickpeas. Peel and roughly chop the garlic clove. When mustard seeds start spluttering, add green chile, garlic clove and cluster beans. Cook covered on low flame for few minutes or until cluster beans change color. Add a splash of water while cooking if necessary and stir occasionally to avoid scorching. Once cooked, stir in finely crumbled black chickpeas mixture, turmeric powder and sufficient salt. Fry on low flame for around a minute or two and remove from heat. Serve cluster beans with black chickpeas over plain steamed rice and dollop of ghee. Notes: Make sure cluster beans are cooked well before adding the black chickpeas. Suggestions: Adjust spice with red chiles or green chiles. Variations: Check other variations with cluster beans and other fresh beans here. Other Names: Cluster Beans with Black Chickpeas, Goru Chikkudu Nalla Senagala Vepudu. Fresh Beans with Garam Masala. Fresh beans are stringed and chopped into inch long pieces. The beans are then pressure cooked and finished in onion tomato masala. Serve fresh beans with garam masala over plain steamed rice or over roti. Makes: around 4 Servings of Fresh Beans with Garam Masala. Wash, string the beans and divide each bean into two exposing the seeds. Chop the divided beans into around inch long pieces. Pressure cook the chopped beans with a pinch of salt and splash of water for around 2 whistles. When mustard seeds start spluttering, add chopped onion and ginger garlic paste. Fry till onion turns translucent, add chopped tomato and salt. Fry till tomato turns soft, add cooked beans, garam masala powder and red chili powder. Fry on low flame for around 5 minutes or until most of the moisture is gone. Stir in chopped cilantro and remove from heat. Serve fresh beans with garam masala over plain steamed rice or over roti. Notes: Make sure beans are cooked well or cook covered in the pan till done. Suggestions: Adjust spice with red chili powder. Variations: check other variations with fresh beans here. Other Names: Fresh Beans with Garam Masala. 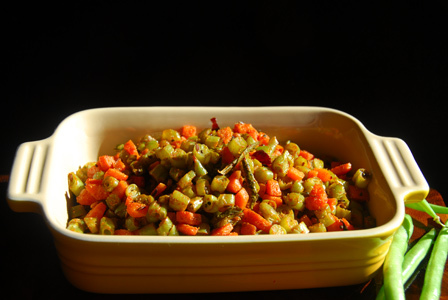 Fresh french beans are finely chopped and cooked in oil along with chopped carrot and other spices. They are then finished with powdered spices like coriander powder. Serve french beans carrot fry over plain steamed rice or with roti. Makes: around 2 1/2 Cups of French Beans Carrot Fry. Wash french beans, remove little bit of both ends and finely chop them. Peel, wash, remove little bit of both ends and chop carrot into small pieces. When mustard seeds start spluttering, add chopped french beans, chopped carrot and few pinches of salt. Cook covered on low flame till beans change color and carrot is cooked. Uncover and fry the beans till they are cooked well. Stir in coriander powder, garam masala powder, red chili powder, turmeric powder and remove from heat. Serve french beans carrot fry over plain steamed rice or with roti. Notes: Make sure french beans are cooked well before spice powders. Suggestions: If french beans are not cooked properly, put it back on heat. Add a splash of water if necessary and cook covered on low flame till done. Variations: You can check other fresh beans recipes here. French Beans with Dalia Powder. 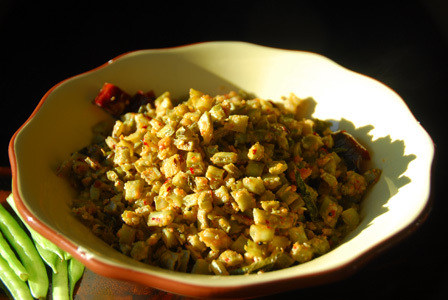 Fresh french beans are finely chopped and cooked in oil along with other spices. They are then finished with dalia powder. 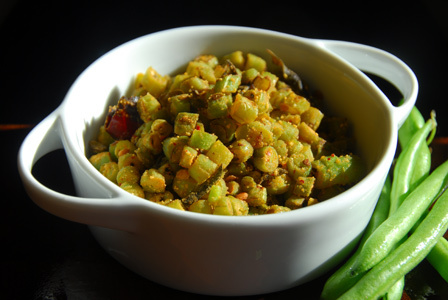 Serve french beans with dalia powder over plain steamed rice or with roti. Click here for dalia powder recipe. Makes: around 2 Cups of French Beans with Dalia Powder. When mustard seeds start spluttering, add chopped french beans and few pinches of salt. Cook covered on low flame till beans change color. Stir in dalia powder and remove from heat. 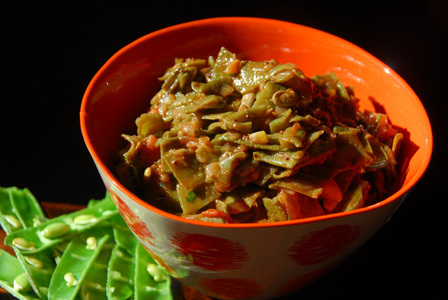 Serve french beans with dalia powder over plain steamed rice or with roti. Notes: Make sure french beans are cooked well before adding dalia powder. Other Names: French Beans with Dalia Powder. Cluster beans / guar is chopped and boiled in water till soft. They are then briefly cooked in oil along with fresh ground sesame seeds powder. Serve cluster beans sesame curry with steamed rice and dollop of ghee or with roti. Makes: around 2 Servings of Cluster Beans Sesame Curry. Wash, remove little bit of both ends and chop cluster beans into small pieces. Bring to boil few cups of water in a sauce pot, add cluster beans and few pinches of salt. Let the cluster beans change color and once cooked, strain the cluster beans. Grind sesame seeds, red chiles, cumin seeds and salt into powder. When mustard seeds start spluttering, add cooked cluster beans and ground sesame powder. Stir well and cook for around 5 minutes on low flame and remove from heat. Serve cluster beans sesame curry with steamed rice or with roti. Notes: Make sure cluster beans are boiled well. Suggestions: Adjust spice with red chiles. If cluster beans are not boiled well, cook the cluster beans covered once they are added to the pan. Variations: Check other variations with cluster beans here. Other Names: Cluster Beans Sesame Curry, Goru Chikkudu Nuvvulu Kura.